New admissions by the Obama administration that American officials physically handed some $1.7 billion in cash to the Iranian government are fueling a congressional investigation into still-hidden details surrounding the deal, according to congressional sources and previously unreported-on letters seen by the Washington Free Beacon. Lawmakers now suspect the Obama administration may have dealt with members of the Iranian Revolutionary Guard Corps (IRGC) and officials from its intelligence ministry when carrying out the cash exchange, which coincided with the release by Iran of several U.S. hostages. The Obama administration recently disclosed to Congress that U.S. officials participated in the handoff of at least $400 million to Iranian officials, but has withheld key details about which parts of the Iranian government assumed control of the cash, according to discussions with multiple sources familiar with ongoing congressional investigation. Multiple sources familiar with the matter told the Free Beacon it is possible IRGC members participated in the exchange, raising new questions about the Obama administration’s dealings with an organization directly responsible for facilitating terrorism and killing U.S. citizens. "On January 17, Treasury disbursed the payment to an official from the Central Bank of Iran, for transfer to Tehran," according to a letter from the Treasury Department to Congress. "The funds were under U.S. Government control until their disbursement pursuant to the settlement." New accounts of the cash exchange reveal that Obama administration officials facilitated three separate cash payments to Iran totaling $1.7 billion and held control over the money until it was placed in the hands of Iranian officials. The State Department’s accounting comports with similar statements made by senior Obama administration officials last week in testimony before Congress. These officials only appeared on Capitol Hill after being threatened with a subpoena. 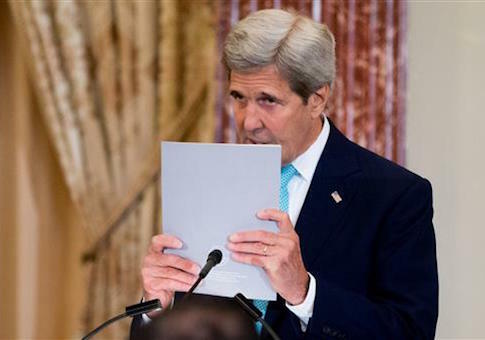 The State Department declined to comment beyond what it has previously stated publicly. The remaining cash was transferred in a similar manner after the Obama administration withdrew $1.3 billion from a taxpayer fund operated by the Treasury Department. "Pursuant to an arrangement between Iran, the Netherlands, and the United States, DNB [the Dutch Central Bank] converted the $1.3 billion into euros," according to the Treasury Department communication. DNB then disbursed the funds as euro banknotes in the Netherlands to an official from the Central Bank of Iran. The disbursement occurred in two installments, one on January 22 and the other on February 5." One senior congressional adviser told the Free Beacon the IRGC routinely orchestrates and operates these types of exchanges. "Iran's spy agency was heavily involved in the negotiations in Switzerland over the hostages," the source said. "The plane that was used to transport the cash to Iran was linked to an airline used by the IRGC. But the Obama administration now seems to be suggesting that when the cash was transferred as leverage for the hostages to the plane, the spy agency and the IRGC just got out of the way? That would be very convenient, but it doesn't sound likely." Sen. Marco Rubio (R., Fla.), among other lawmakers, has petitioned the Obama administration to disclose the names of the U.S. and Iranian officials who played a role in the cash handoff. "What U.S. official(s) escorted the pallets of cash to Iranian officials and what entity of the Iranian government received the funds and controlled the flight(s) that transported the cash to Iran?" Rubio asked in a Sept. 10 letter to the administration. "Please provide a list of the Iranian officials present at the exchange of cash and include the Iranian government entities that employed them, including any past or current connections to the Islamic Revolutionary Guard Corps or Iran’s Ministry of Intelligence," Rubio wrote. Lawmakers working to unearth further details about the exchange told the Free Beacon that it appears increasingly likely that the IRGC played a role in the cash exchange. "For the Obama administration to argue that the IRGC was somehow not involved in the U.S. transfer of $1.7 billion—or more—in cash to Iran is totally unconvincing," Rep. Mike Pompeo (R., Kan.), a member of the House Intelligence Committee, told the Free Beacon. "Given the IRGC’s extensive control of the Iranian economy, and its vast influence with Iran’s regime, it was most likely influential in the set-up and execution of the payment. Like other malicious actors, the IRGC is eager to get its hands on cash to fund its terrorist activities." Pompeo and Rubio are the authors of new legislation that would block the administration from conducting any further cash payments to Iran and force the Islamic Republic to return money awarded to it in the past. Sen. Mark Kirk (R., Ill.), who is sponsoring the Senate version of Pompeo’s bill, told the Free Beacon that the administration is reluctant to answer questions because the truth may be unsettling to Americans. "The administration probably doesn’t want to answer questions about who all from Iran’s government actually accepted the $1.7 billion cash payments or where planes bearing the cash payments landed inside of Iran because honest answers will only raise more disturbing questions about the IRGC’s likely involvement and the growing dangers of terrorism financing," said Kirk, chair of the Senate Banking subcommittee, which has oversight of the Treasury Department’s national security-related activities, Iran sanctions laws, and terrorism financing. UPDATE 6:00 P.M.: A previous version of this post attributed a quote to the State Department. It was written by the Treasury Department.